Our NATE certified, trained air conditioning technicians have several years of experience when it comes to air conditioning repair and installation in West Palm Beach. 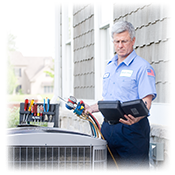 We are proud to offer fast, 24 hour emergency AC repair service for those unexpected air conditioning troubles. Need plumbing help? Lindstrom plumbers can do the job! From drain cleaning and water heater repair to leak detection and re-piping, our plumbers are ready to assist with all of your plumbing needs. We provide emergency plumbing service to West Palm Beach residents performed by plumbers that are licensed, trained, and friendly. For plumbing issues big and small, we offer the services and products to meet them. Give Lindstrom a call when you need a plumber in West Palm Beach! Whatever your specific air conditioning or plumbing needs may be, you can depend on Lindstrom Air Conditioning & Plumbing for skilled service at a fair price. Give us a call when you need air conditioning or plumbing service, or schedule an appointment online now. “Lindstrom did a wonderful job on a timely basis installing my non functioning 5 ton AC. I was very pleased with the price and the professional way they were from the salesperson to the installers.” – Darryl A.